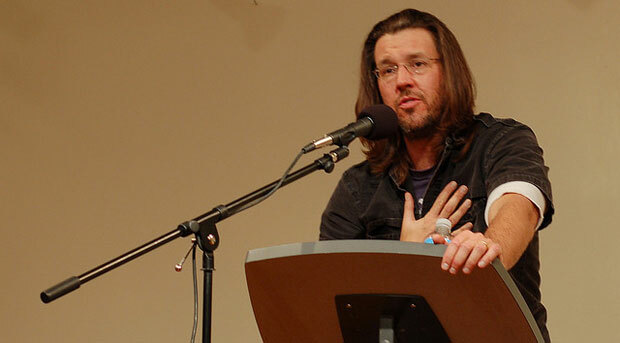 David Foster Wallace was born on 21st February, 1962. He was an American author and is renowned all over the world for his highly acclaimed essays, novels and short stories. Furthermore, he was also a professor at the Pomona College in Claremont, California. He is perhaps most famously known for novel, Infinite Jest, which was published in 1996. It was included by Times in its All-Time 100 Greatest Novels list, which covers the period from 1923-2006. He is also cited by the Los Angeles Times book editor, David Ulin as”one of the most influential and innovative writers of the last 20 years”. He wrote an incomplete novel, The Pale King, which was published in 2011. His biography by D.T.Max is slated for release in 2012. He was born in Ithaca, New York to James Donald Wallace and Sally Foster Wallace and he spent his early childhood in Champaign, Illinois. When he was in his fourth grade, he relocated to Urbana and started to attend the Yankee Ridge School and Urbana High School. During his adolescent years, Wallace managed to assert his ranking as a regional junior tennis player. Later on, Wallace went to his father’s Amherst College and graduated with a major in English and Philosophy, with a major focus being on mathematics and modal logic. He did a thesis on philosophy called the Richard Taylor’s Fatalism and the Semantics of Physical Modality, which received the prestigious Gail Kennedy Memorial Prize. He also did another research thesis in English, which became his first novel. He graduated with a Master of Fine Arts in Creative Writing, from the University of Arizona. Although, Wallace hasn’t explicitly mentioned in any of his writings, he belonged to a church, where he resided. His father was James D. Wallace who took up a teaching job at the University of Illinois at Urbana Champaign during the year of 1962, when his work and studies on philosophy was ended at the Cornell University. His father did his PhD from Cornell in the year of 1963 and is now serving as a professor at the University of Urbana Champaign. His mother, Sally Wallace went to graduate school for a degree in English composition at Parkland College. Additionally, she also won an award for being the Professor of the Year in 1996. Coming from a family of highly erudite scholars, it is no surprise that his youngest sister, Amy Wallace is practicing law since 2005. David has unarguably established himself as one of the most famous and widely read authors in contemporary times.